So, you've never had a cat before and now you do. Worried about this new creature's strange behavior? Wondering what to feed? No idea what a litterbox is? Don't panic - we've got you covered! If you haven't the faintest idea about what to do with your new furriend, we're here to help! This guide will walk you through the basics of understanding your cat and providing him or her with the best possible care. Take a deep breath and grab a coffee. This is the first step in your journey to knowing a wonderful animal and making a lifelong friend. Cats come into our lives in all manner of ways. Maybe you decided you needed a pet and figured a cat sounds like a good option. Or maybe you were walking down the street and couldn't resist picking up this cute stray kitten and bringing him home with you. Either way, once Kitty is with you, you have a responsibility to care for her or his needs. Meeting those needs begins with understanding them, so without further ado, let us introduce you to the concept of a cat. What is this creature anyway? Ok, so it looks furry and kinda cute, but what are we dealing with here exactly? Cats are felines, members of the same family as lions, tigers and leopards. In other words, your cat is a highly sophisticated predator, designed to hunt small critters, mostly rodents and birds. Your cat is also a domesticated animal. That means he or she thrives on human companionship and needs your care, protection and love. To your cat, you are a big cat, not unlike a mother cat is to her kittens. Let's look at some basic qualities of domestic cats. Regardless of the image you may have of cats, your own cat is an individual with his or her own temperament and habits. Cats vary greatly in levels of activity, aggression, vocalization and a slew of other qualities. Don't be surprised if your cat doesn't actually have every one of the qualities described here. Cats like to "get up there"
A healthy adult cat is an athletic creature that can run, jump and climb trees. You may find that your cat likes to jump on the kitchen counters or climb the cupboards. That's a perfectly reasonable thing to do if you're a cat. There are ways to keep cats out of areas where they shouldn't be but your cat will likely need access to as many above-ground spots as possible. Many cat owners buy or make cat trees or install shelves along the walls where their cats can perch. By the way, cats also love hiding inside boxes and other small spaces. That is to say, cats are active mostly around dusk and dawn and may be up anytime of the day or night. Your cat has excellent night vision, so even a little bit of light is enough for him or her to get around at nighttime. Don't be surprised if you hear Kitty up and about at 2am. That's perfectly normal for a cat. On average, cats sleep 12-16 hours a day. Most cats enjoy a mix of catnaps throughout the day and night, but don't be surprised if you notice your cat spends a lot of the daylight hours sound asleep because, as mentioned earlier, cats are nocturnal. Everyone knows that cats meow. However, the sound of that meow can vary and with time you may be able to discern different "cat words" that your cat is saying. The amount of vocalization changes from one cat to another and can be anything from monastic silence to constant operatic performances. Some cats also chirp and chatter when they're excited. Cats can also hiss, growl and yowl. These are signs of fear and imminent aggression, so if you hear them, keep your distance from the cat and let her calm down. Constant "crying" or yowling can also be a sign of heat in non-spayed females. Last but not least: Purring. Most cats purr when they are happy or wish to appear non-threatening. Some can be very loud too. Don't worry, it's just your cat's way to show affection. Enjoy the sound! Cats express themselves through body language, and their signals are quite different from those of dogs. For example, when a cat "wags" her or his tail, they're probably not happy and could lash out if you try to pet them. Another tip for beginners: Avoid staring into Kitty's eyes. A direct stare can be interpreted as threatening, and unless the cat knows you very well, he or she may feel intimidated and possibly even lash out. Take note of your cat's body language and with time you'll get better at understanding it. In fact, cats scratch certain surfaces not only to sharpen their claws, but also to mark their territory and relieve stress. You can't teach a cat to avoid this behavior entirely because it's just part of their nature. Instead, you should provide your cat with appropriate scratching surfaces, such as a suitable scratching post. You can teach your cat not to scratch your beloved couch, but only after you find the right scratching post that he or she will actually use. Our furtive little felines want to keep both prey and potential predators from knowing where they live. To do that, they bury their own feces and urine in the ground. Usually, a cat will find a nice spot, dig a small hole, do her business and then cover it with soil. In your home, you want that spot to be the litterbox, so you have to provide Kitty with a good one and keep it clean. Cats are hardwired to hunt small animals. That means you should not leave a cat unattended with your pet gerbil, gecko or budgie. It also means you're likely to see your cat respond to stimuli that resemble their prey, a quality that works well for playtime sessions. Just because Kitty isn't crying in pain doesn't mean she's well. Cats tend to hide pain and discomfort so you need to acquaint yourself with the telltale signs of health problems in cats. Kittens are extremely energetic and curious. When they're not sleeping or eating, they will be out there exploring the world and playing with just about anything. This is how kittens learn about the world and how they hone their "cat skills". These skills include hunting, so kittens are also more likely to bite and scratch you as they play. This level of energy gradually subsides but it can take up to a year or even two before your kitten really calms down. Many kittens need to chew things as well. If your kitten or cat is a chewer, read this article: How To Stop Problem Chewing In Cats. Important note: This article does not deal with newborn kittens - those in the first 3-4 weeks of their lives - so if you have a newborn on your hands, please refer to this guide about raising newborn kittens. Also, start a thread in the Pregnant Cat & Kitten Care forum. Raising newborns is challenging even for experienced cat owners, so you're going to need all the help you can get. Now that you know a little bit about cats and their behavior, let's see what your duties as a cat owner are. Hopefully, your new cat is healthy and will just need a quick check-up and a first round of vaccinations. 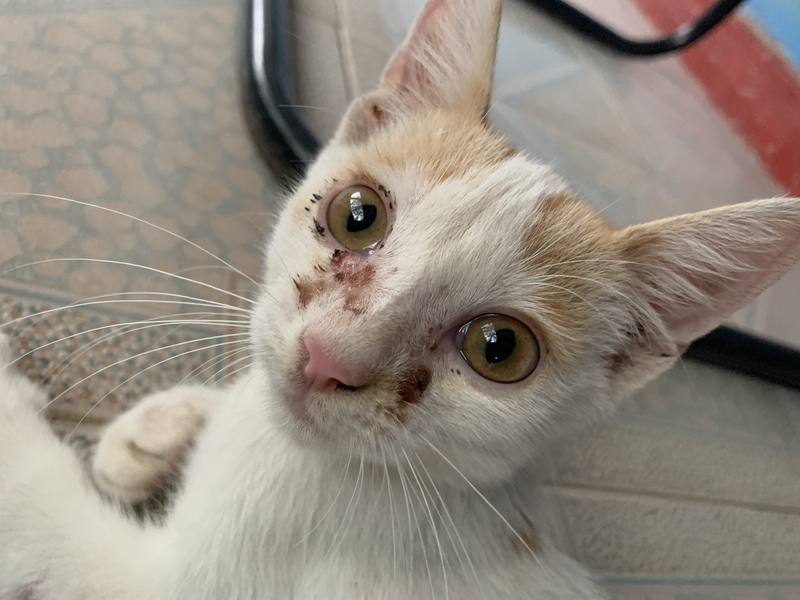 If you rescued a stray cat off the street, there's a good chance the vet will need to treat her or him for worms and fleas as well. Take the time to find a good veterinarian that you feel comfortable with, as this person is going to be your ally in caring for your cat for years to come. Read more: How To Choose The Best Veterinarian For My Cat? One of the most important things you can do for your cat is spaying (if a female) or neutering (if a male). If you adopted from a shelter, your cat has probably already had the procedure. If you found a cat, talk to your vet and schedule a spay or neutering. For various reasons, cats should ideally be spayed or neutered before they reach sexual maturity, so don't delay this. Your cat should not be declawed. Declawing is illegal in most Western countries, but if you live in the US, your veterinarian may bring it up as an option. Please do not have your cat's claws permanently removed. The procedure is extremely painful and unnecessary. Your cat is a carnivore and must be fed animal-based nutrition or he will get very sick and die. Your best option as a beginner is to buy quality cat food at a pet store. Make sure the food is classified as "complete and balanced" for all life stages. If you have a kitten, it's best to choose a kitten formula, as it's more nutritious and better suited for the needs of a growing body. There are many ways to feed a cat. Some owners free-feed, filling up Kitty's dish daily and letting him or her eat at will. Others prefer to limit feeding times. For a young or underweight cat, free-feeding is usually the best option, but an overweight cat may need stricter portion control. You must provide your cat with a large clean litterbox. That means a large box that is filled with a couple of inches of kitty litter. You can buy litter at the pet store and here too, preferences vary among owners and cats. Most owners prefer clumping litter because it turns urine into solid waste that's easier to scoop. And scoop you will, at least once a day. Keeping the box clean is key for your cat to use it. Place the litterbox in an area where the cat can easily access it any time of day or night. Don't expect a cat to "hold it" for the night and don't make getting to the box too difficult. Place it away from food and water dishes too. Your cat needs a good scratching post and preferably more than one. Scratching posts need to be strong, stable, long and accessible. You should place a scratching post where you tend to spend the most time around your home as this is where Kitty is likely to hang around and mark it as his or her territory. It's best to offer both a vertical and a horizontal post and see which one your new cat prefers, as this is a matter of personal feline taste. Just like us, cats need to move around and exercise to stay fit and healthy. Playing behavior is also important and helps your cat practice mental and physical skills and relieve stress. Have cat trees in your home, to encourage Kitty to climb and move around. Provide special cat toys, such as stuffed mice and small lightweight balls. There are special toys shaped like a fishing pole that allow you to play along with your cat. This interactive playtime can be very good for strengthening your bond while getting Kitty some exercise. Cats sleep a lot, but you don't really have to provide them with a special bed. Your cat will find his or her favorite napping spots around your home, which may or may not include that fancy cat bed you bought for them. Many cats prefer to sleep in the same bed as their owner. This is a sign of trust: Kitty feels more secure with you around, just like a kitten would with Mama Cat. By the way, if you're reading this and still haven't made up your mind whether or not you want a cat in your life, please read this: 15 Things You Should Know Before Adopting A Cat. We've prepared a shopping list for you! This New Cat Checklist: What You Need to Get Before Bringing Kitty Home covers the basics and points you towards some important guides that will help you make informed decisions. Ideally, you should get everything ready before bringing Kitty home. This includes setting up a safe space where the new cat can take the time to gradually adjust to the new setting. You should also make sure your home is safe for a cat and prepare other family members for the new arrival. Now is also the time to ask about local veterinarians and decide which one will be taking care of your cat's health. But what if you had no time to prepare? Walking down the street, you heard a weak scared "Meow" that broke your heart? Scooped up a kitten or cat and brought them home, but now what? Don't panic! Even if you know nothing about cats, we've got your back here! First, is this kitten a newborn? Are his eyes still closed? Click here for our newborn kitten care guide and start a thread in the Pregnant Cat & Kittens forum where members can help you. Not a newborn? Then your next concern is the cat's health. If the cat is injured or sick, find a nearby veterinarian and get there as soon as possible. If Kitty looks healthy, then start with the urgent basics. Allocate one room in your home and keep the cat there for now. Make sure it's quiet and that children or other pets can't get into the room. Make sure Kitty won't be able to squeeze her way out of the room. Shut all the windows and block up any holes and gaps such as chimneys, vents and gaps around household appliances that kitty can venture into and get stuck. A few cans of cat food. Adult or kitten formula, depending on the age of your new cat. You'll need a few more things, but you can get through the next couple of days once you read our New Cat Shopping List and do some research. Cat food and litter are available at most general stores. If you can't find a litterbox, any large sturdy plastic box will do. When you return home, layer the box with approximately two inches of cat litter, evenly spread. Place the box in one corner of the room and the cat's food and water dishes at the opposite corner, as far away from the box as possible. Voila! Your cat now has a functioning sanctuary room! Is that all? Nope. There's a learning curve here and now's the time to start reading as much as you can about cat care. Start a thread in the Cat Care forum and let us know all about your new cat and your level of expertise. Our members will be happy to help you deal with any question or problem along the way and point you in the right direction for further reading. Whether a planned adoption of an emergency one, your cat will need time to adjust to his or her new home. As a rule of thumb, the younger the cat, the shorter and faster the adjustment, but as with any rule, there can be exceptions. Some adult cats are more flexible and easily adapt to new situations. Our guide How To Help A New Cat Adjust To Your Home covers everything you need to know about easing the process and remember, patience and love are key here. Good! You should! You can't learn everything you need to know about cats from one article. Hopefully, you have the basics covered now and know what to do next. And remember, we're here for you! If you have any questions, if you need advice or support, just start a thread in the forums and let us know all about your new furry friend! 8kitties, acrazycatlady, Tilazt and 2 others purraised this. Decided to take in this stray ,very sweet and likes to play.Eats well.Just concerned with what’s going on at the eyes.There is no vet nowhere at all where I am.WHAT CAN I DO.Also new! So even if that “kitten” is very big at 8 months, he’s still a psychotic, co-dependent “kitten”? This is an really a great course in Cat 101! Thanks to you. It help me so much and it will help so many cats and many cat lovers-in-the-making. Hello, not really sure where to post this, but would it be possible for me to get permission to translate this article to French? I am currently helping my little feline sister raise her four babies, three of which I will unfortunately have to give away (I wish I could keep them all...) anyway, as I was saying, I would like to help the people I will give my little living, breathing balls of furry love to, by giving them good advice, which, surprise! I found here already compiled and well written. The problem? None of the handpicked(by me) future-furloveball-owners speak English... And since I can with minimal effort translate it nicely, I would really appreciate the authorisation to do so. Obvously it is for personal use only and by no means meat to be published or even used or read by more than 3 people and their relatives. Please? As a side note, thank you very much for this good article. This is an excellent idea, @Tilazt! I would try contacting one of the moderators, to start with. Thsnk you for this very useful guide. I'm about to jump back in and have a mental list, but it's nice to see everything in black and white. tarasgirl06 and Ember11681 purraised this. Great article for first time cat owners. You forget how much prep there is once you have a cat in the house and just add a second one. Maybe add "illness" in with the pain portion? I read the list of signs of pain but I can definitely relate plenty of those to Sassy w/her hyperthyroidism. omgosh I wish I had found this site back in 2008.
tarasgirl06 and Scarlettohara66 purraised this. Wish I had had something like this when I was bringing my two tabby girls home. I would have been a much more able cat guardian. This is an excellent course in Cat 101! Thank you for it. Hopefully it will help many cats and many cat lovers-in-the-making. Scarlettohara66 and Ember11681 purraised this.